Number 4 is an 0-6-0 switching locomotive built by the Vulcan Iron Works (of PA) in July of 1911 for the State Board of Harbor Commissioners for use on the State Belt Railroad of California along the San Francisco waterfront. This is Vulcan's first oil burning locomotive. 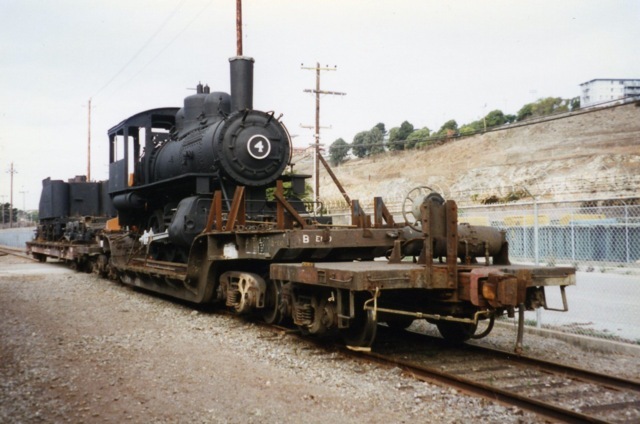 The locomotive featured a closed cab when delivered that was changed to an open one upon arrival in San Francisco. After duty along the waterfront, No. 4 had a unique and diverse career that included shortline and industrial railroads, and even a stint for Uncle Sam before sleeping away 30+ years in a Stockton scrap yard. From there she went to Utah for potential restoration, but found her way back to San Francisco! * Cylinders: 19" X 24"
Select a SWITCH for more information on the following topics! Information on the purchase and operation of the locomotive in San Francisco and elsewhere. Information on where the engine went after retirement. Information the restoration of the locomotive.